I know -- you're probably thinking "potato scones!?" So did I, when I saw this pop up on the internet. I had some leftover potatoes that I wanted to use up, and I was in the mood for a bigger breakfast. So I did a search for brunch recipes using potatoes, and Martha Stewart's recipe for potato scones came to me. I love scones ... English scones, and I love potatoes. So I figured it couldn't be all that bad. These turned out to be incredibly rich, incredibly creamy ... maybe a tad bit too much for breakfast, but a creative side to a meat dish for lunch or dinner. Now, this is a pretty work-intensive recipe, so if you're intent on making them, set aside enough time to make these in the morning, or the night before. 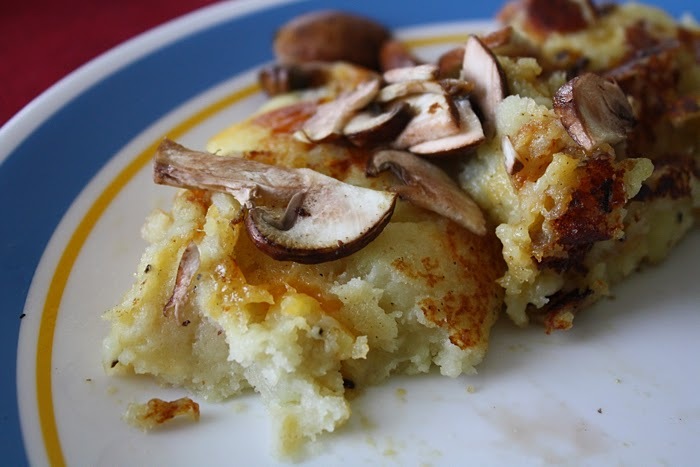 Also: if you'd like an easier alternative to this particular recipe, I'd say you could absolutely get away with using leftover mashed potatoes or mashed potatoes mix in lieu of fresh potatoes. Bring the potatoes to a boil in a pot of lightly salted water. Reduce heat and simmer until "fork tender," about 8 to 10 minutes. Drain well. Mash the potatoes while they are still warm, until they are smooth. 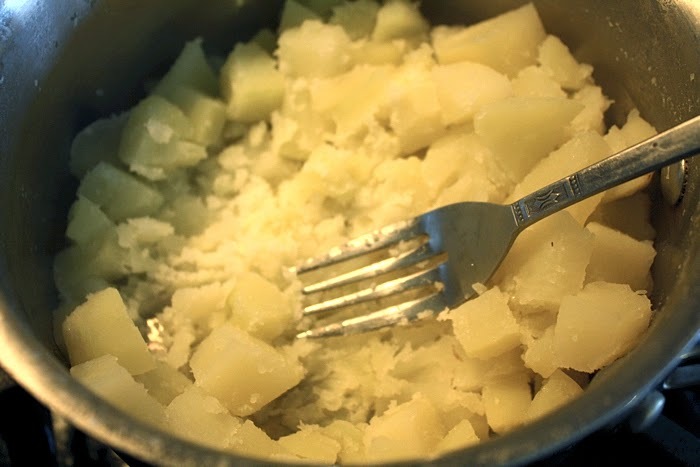 Add the 3 tablespoons of butter to the potatoes and combine well. Stir together the baking powder, 1/2 teaspoon of salt and a pinch of pepper (or to your liking), and add this mixture to the potatoes with a wooden spoon until just combined. Form dough into a ball on a lightly floured work surface, and cover the dough with a damp dish towel or paper towel. Allow to cool for 20 minutes. Dust your rolling pin and work surface with flour, and roll out the potato dough into a rectangle, roughly 5x8. Sprinkle half with cheese, and fold to create a 5x4 rectangle. Gently roll it out again and cut dough into 2 rectangles, than halve each rectangle diagonally to create a total of 4 triangles. Heat a non-stick skillet, griddle or cast-iron pan over medium heat, then add 1 teaspoon of butter to coat the surface. When it has completely melted, turn the heat down to medium low and cook the scones until they are golden brown and the cheese melts, about 3-4 minutes per side. Keep the scones in a 200 degree F oven to retain warmth. Top with your favorite seasonings or toppings if desired, like paprika, chives or mushrooms. Like I said before, this is an incredibly rich recipe. If you would like a less rich potato scone, I would suggest cutting down on the butter and cheese. Otherwise, this is a really interesting (I mean that in a good way) experience of the potato -- smooth and creamy on the inside, crispy on the outside, and warm all over. Delicious, and filling.